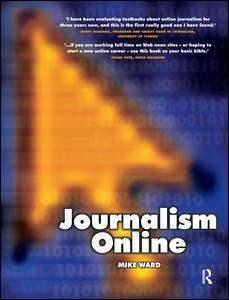 Journalism Online tackles the pressing question of how to apply fundamental journalism skills to the online medium. It provides an essential guide to the Internet as a research and publishing tool. In particular, it examines how to forge key journalism skills with the distinctive qualities of the World Wide Web to provide compelling web content. - web site design for the effective use of content. Journalism Online takes the best of the 'new' and 'old' media to provide an essential primer for this emerging discipline. Leading web designers such as Jakob Nielsen rub shoulders with established journalists like Harold Evans in the search for clear guidance in this rapidly developing field. It also provides a useful insight for non-news organisations into how to prepare and present effective web content and avoid the deepest pitfall of the online world - being ignored. Supplementary resources can be found on the book's supporting web site www.journalismonline.co.uk, which features additional exercises, useful links and reviews.